Microcline: Mineral information, data and localities. White, grey, greyish yellow, yellowish, tan, salmon-pink, bluish green, green. Name given in 1830 by Johann Friedrich August Breithaupt to a reddish to brownish feldspar from Arendal, Norway, and a feldspar with bluish schiller from Stavern (formerly Fredrichsvärn), Norway, from the Greek μικρός (little) and κλινειν (to incline), in allusion to the small departure from monoclinic symmetry. Visit gemdat.org for gemological information about Microcline. Prismatic crystals (to 50 m and 13,500 t), granular, massive. Commonly forms perthitic intergrowths. Carlsbad, Baveno, Manebach, polysynthetic on albite and pericline laws. Non-standard unit-cell setting (space group C-1, chosen by convention to facilitate comparison with C-centred monoclinic orthoclase and sanidine); reduced cell has the following cell-parameters: ~7.22, ~7.62, ~7.92 Å, ~113.1, ~104.2, ~103.7° (space group P-1). Amazonite A green to blue-green variety of K-feldspar, usually microcline, but sometimes applied to orthoclase. The color is usually caused by an elevated content of Pb (up to 1.2% PbO, see list of references). Hyalophane Feldspar Group . Celsian-Hyalophane Series, and the Hyalophane-Orthoclase Series (intermediate member). Originally reported from Lengenbach Quarry, Im Feld (Imfeld; Feld; Fäld), Binn Valley, Wallis (Valais), Switzerland. Biotite A series or subgroup of the Mica Group. Smoky Quartz 663 photos of Microcline associated with Smoky Quartz on mindat.org. Quartz 546 photos of Microcline associated with Quartz on mindat.org. Albite 422 photos of Microcline associated with Albite on mindat.org. Muscovite 349 photos of Microcline associated with Muscovite on mindat.org. Aegirine 313 photos of Microcline associated with Aegirine on mindat.org. Spessartine 289 photos of Microcline associated with Spessartine on mindat.org. Fluorite 204 photos of Microcline associated with Fluorite on mindat.org. Schorl 149 photos of Microcline associated with Schorl on mindat.org. Aquamarine 113 photos of Microcline associated with Aquamarine on mindat.org. Cleavelandite 106 photos of Microcline associated with Cleavelandite on mindat.org. 16.3.1 Lithosite K6Al4Si8O25 · 2H2O Mon. Breithaupt, A. (1830) Ueber die Felsite und einige neue Specien ihres Geschlechts. Journal für Chemie und Physik: 60: 316-330. Bachinski, S.W., Müller, G. (1971) Experimental determinations of the microcline-low albite solvus. Journal of Petrology: 1(2): 329-356. Ferguson, R.B. (1979) Whence orthoclase and microcline? A crystallographer's interpretation of potassium feldspar phase relations. The Canadian Mineralogist: 17: 515-525. Cherry, M.E., Trembath, L.T. (1979) The disordering of alkali feldspars; I, Dry heating of a microcline perthite. The Canadian Mineralogist: 17: 527-535. Eggleton, R.A., Buseck, P.R. (1980) The orthoclase-microcline inversion: A high-resolution transmission electron microscope study and strain analysis. Contributions to Mineralogy and Petrology: 74: 123-133. Fitz Gerald, J.D., McLaren, A.C. (1982) The microstructures of microcline from some granitic rocks and pegmatites. Contributions to Mineralogy and Petrology: 80: 219-229. (1984) Bulletin de la Société française de Minéralogie et de Cristallographie: 107: 401. Goldsmith, J. (1988) Enhanced Al/Si diffusion in KAlSi3O8 at high pressures: the effect of hydrogen. Journal of Geology: 96: 109-124. London, D., Cerny, P., Loomis, J., Pan, J.J. (1990) Phosphorus in alkali feldspars of rare-element granitic pegmatites. The Canadian Mineralogist: 28: 771-786. Waldron, K.A., Parsons, I., Brown, W.L. (1993) Solution-redeposition and the orthoclase-microcline transformation: evidence from granulites and relevance to 18O exchange. Mineralogical Magazine: 57: 687-695. Allan, D.R. Angel, R.J. (1997) A high-pressure structural study of microcline (KAlSi3O8) to 7 GPa. European Journal of Mineralogy: 9: 263-275. The following Microcline specimens are currently listed for sale on minfind.com. Bariand, P. and Poullen, J.F. (1978). Famous mineral localities: The pegmatites of Laghman - Nuristan - Afghanistan. Mineralogical Record. 9: 301-308. Merkel, S., Bräutigam, B., Klein, S., & Hauptmann, A. (2013). The Analysis of Slag from the Panjhır Mining Region, Afghanistan: An Investigation of (Medieval) Silver Production Technology. Archäologische Mitteilungen, 45, 231-250. Edward S. Grew Surinamite, taafeite and beryllian saphirine from pegmatites in graulite-facies rocks of Casey Bay, Enderby Land, Antarctica, - Am. Miner., 1981,v.66, p.1022-1033. Harris, C., & Rickard, R. S. (1987). Rare-earth-rich eudialyte and dalyite from a peralkaline granite dyke at Straumsvola, Dronning Maud Land, Antarctica. Canadian Mineralogist, 25, 755-762. Raul Jorge Tauber Larry field observations, 2007. Raúl Jorge Tauber Larry (2010). COLOMBO, Fernando; LIRA, Raúl and PANNUNZIO MINER, Elisa V.. Mineralogical Characterization Of Topaz From Miarolitic Pegmatites And W-Bearing Greisen In The A-Type El Portezuelo Granite, Papachacra (Catamarca Province). Rev. Asoc. Geol. Argent. [online]. 2009, vol.64, n.2, pp. 194-200. Colombo, F., & Sfragulla, J. (2012). The garnet–phosphate buffer in peraluminous granitic magmas: a case study from pegmatites in the Pocho district, Córdoba, Argentina. The Canadian Mineralogist, 50(6), 1555-1571. LOCATI, Francisco; COLOMBO, Fernando and BALDO, Edgardo G. A.. Pegmatites with allanite-(Ce) related tothe orthopyroxene-bearing orthogneiss of the Quebrada del Río Suquía, SierrasChicas de Córdoba. Rev. Asoc. Geol. Argent. [online]. 2009, vol.64, n.4, pp. 646-656. Demartis, M., Melgarejo, J. C., Colombo, F., Alfonso, P., Coniglio, J. E., Pinotti, L. P., & D’Eramo, F. J. (2014). Extreme F activities in late pegmatitic events as a key factor for LILE and HFSE enrichment: The Ángel pegmatite, central Argentina. The Canadian Mineralogist, 52(2), 247-269. Dina, H. (1993). Hentschelita en Cerro Blanco, Tanti, Córdoba. Informacion Tecnologica, 48(3-4), 277-282. Roda-Robles, E., Galliski, M. A., Roquet, M. B., Hatert, F., & de Paeseval, P. (2012). Phosphate nodules containing two distinct assemblages in the Cema granitic pegmatite, San Luis province, Argentina: Paragenesis, composition and significance. The Canadian Mineralogist, 50(4), 913-931. Juan C. Porto (1961) - Informe sobre una inspección a las pegmatitas de Alto Cazadero y Cueva Bazán, Sierras de Quilmes. Tucumán. Dirección Prov. de Minas. Inédito. Tucumán. R. J. Tauber Larry (2012). Visita a los cuerpos pegmatíticos de Estancia Anchilla, Departamento Tafí del Valle, Provincia de Tucum´´an. ; R. J.Tauber Larry (2012). Visita a los cuerpos pegmatíticos de Estancia Anchilla, Departamento Tafí del Valle, Provincia de Tucumán. Raúl J. Tauber Larry´s collection. Pidgeon, R.T., Compston, W. (1965) The Age and Origin of the Cooma Granite and its Associated Metamorphic Zones, New South Wales. Journal of Petrology, 6, Part 2, 193-222. Katz, M. B., & Tuckwell, K. D. (1979). Controls of tin-bearing pegmatites and granites in the Precambrian of Broken Hill, Australia. Bull. Geol. Soc. Malaysia, 11, 253-265. 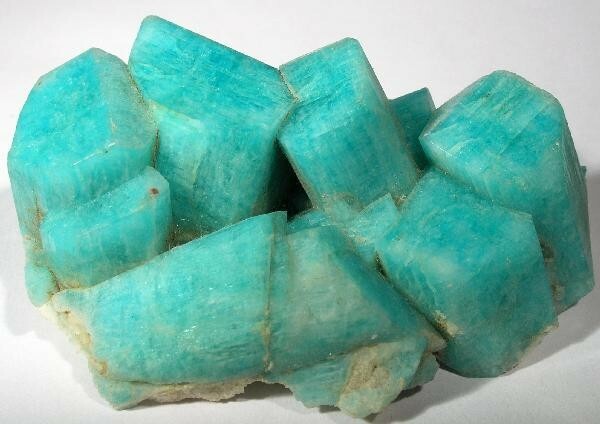 [var: Amazonite] Girdauskas Minerals specimen, via Eugene Carmichael collection, allegedly Pb-rich, associated with spessartine. [var: Amazonite] Thompson, D. (ed) (1986) A Guide to Fossicking in the Northern Territory. Northern Territory Geological Survey, Northern Territory Department of Mines and Energy, 2nd ed., 73p. Warren, R.G., Stewart, A.J., Shaw, R.D. (1974) Summary of Information on Mineral Deposits of the Arunta Complex, Alice Springs area, NT. Department of Minerals and Energy, Bureau of Mineral Resources, Geology and Geophysics, Record 1974/17. Owen, H.B. (1945) Notes on the Pannikin and Elbow mica deposits Harts Range, N.T., Department of Supply and Shipping/Mineral Resources Survey Branch, Record 1945/5. Shaw, R.D. & Freeman, M.J. (1985) Illogwa Creek, Northern Territory (Second Edition) 1:250 000 geological series, explanatory notes, SF/53-15. Department of Resources & Energy, Bureau of Mineral Resources, Geology and Geophysics. Joklik, G. F. (1955) The geology and mica-fields of the Harts Range, central Australia. Bureau of Mineral Resources, Geology amd Geophysics, Australia, Bulletin 26. Rochow, K. (1962) An Investigation of the Harts Range and Plenty River Mica Mines, Bureau of Mineral Resources, Geology and Geophysics, Commonwealth of Australia, Record 1962/34. Barraclough, D. (1979) Geological investigations at the Molyhil Scheelite Mine, Central Australia. Northern Territory Geological Survey Report, GS 79/016. Williams, P. J., & Heinemann, M. (1993). Maramungee; a Proterozoic Zn skarn in the Cloncurry District, Mount Isa Inlier, Queensland, Australia. Economic Geology, 88(5), 1114-1134. [var: Amazonite] Barnes L. C., et al, (1980), Some Semiprecious and Ornamental Stones of South Australia, Government Printer, Adelaide, South Australia. Greg Dainty colln. Hage, B., Geology of the Poonindie Quartzite Quarry, Department of Mines and Energy South Australia. Eggleton, R. A. (1959). The geology of some pegmatites near Gumeracha South Australia. Honours thesis. [var: Hyalophane] Graham, J. (1978) Manganochromite, palladium antimonide, and some unusual mineral associations at the Nairne pyrite deposit, South Australia. American Mineralogist, Vol. 63, pp. 1166-1174. Lottermoser, B.G., and Lu, J. (1997): Mineralogy and Petrology 59, 1-19. Catalogue of South Australian Minerals - 1983; Lottermoser, B. G., & Lu, J. (1997). Petrogenesis of rare-element pegmatites in the Olary Block, South Australia, part 1. Mineralogy and chemical evolution. Mineralogy and Petrology, 59(1-2), 1-19. JACK, R., 1968. Banca Mine, Winnaleah District, Technical Report Department of Mines Tasmania, 11 , 16-19. - Bottrill, R.S. and Baker, W.E., 2008. Catalogue of Minerals of Tasmania. Mineral Resources Tasmania. Bridge, P.J., Pryce, M.W. (1974) Clinobisvanite, monoclinic BiVO₄, a new mineral from Yinnietharra, Western Australia. Mineralogical Magazine 39:308, 847-849. Report of the Department of Mines for the State of Western Australia for the Year 1942, pp 84-85. Marston, R.J. (1984) Nickel Mineralization in Western Australia. Mineral Resources Bulletin 14, Geological Survey of Western Australia, 291p. Pegmatites of Western Australia; M Jacobson, M Calderwood, B Grguric; Hesperian Press, Perth, 2007. Pegmatites of Western Australia; M Jacobson, M Calderwood, B Grguric; Hesperian Press, Perth 2007. Jaques, A.L., Lewis. J.D., Smith, C.B. (1986) The kimberlites and lamproites of Western Australia. Geological Society of Western Australia, Bulletin No. 132, 268p and maps. Pegamatites of Western Australia; M Jacobson, M Calderwood, B Grguric; Hesperian Press, Perth, 2007. Mueller, Andreas G.; Lawrance, Louisa M.; Muhling, Janet; Pooley, Gregory D. (2012): Mineralogy and PTX relationships of the Archean Hannan South Au-Cu (Co-Bi) deposit, Kalgoorlie, Western Australia: thermodynamic constraints on the formation of a zoned intrusion-related skarn. Economic Geology 107, 1-24. Mueller, A.G., Hall, G.C., Nemchin, A.A., Stein, H.J., Creaser, R.A., and Mason, D.R. (2008): Mineralium Deposita 43, 337-362. Spaggiari, G.V., Kirkland, C.L., Pawley, M.J., Smithies, R.H., Wingate, M.T.D., Doyle, M.C., Blenkinsop, T.G., Clark, C., Oorschot, C.W., Fox, L.J., Savage, J. (2011): The Geology of the East Albany-Fraser Orogen - a field guide, Geological Society of Western Australia, Department of Mines and Petroleum, State Government of Western Australia, Record 2011/23. Simpson, Edward S. (1952) Minerals of Western Australia Vol 3 (Facsimile ed. 1984). Hesperian Press, Carlisle, Western Australia p 342. [var: Amazonite] Calderwood, M.A., Grguric;, B.A., Jacobson, M.I., (2007): Guidebook to the Pegmatites of Western Australia; Hesperian Press, Perth, 2007. Calderwood, M.A., Grguric;, B.A., Jacobson, M.I., (2007): Guidebook to the Pegmatites of Western Australia; Hesperian Press, Perth, 2007. Simpson, Edward S. (1952) Minerals of Western Australia Vol 3 (Facsimile ed. 1984). Hesperian Press, Carlisle, Western Australia, p 215. Calderwood, M.A., Grguric, B.A., Jacobson, M.I., (2007). Guidebook to the Pegmatites of Western Australia. Hesperian Press, Carlisle, Western Australia. Fetherston, J, Stocklmayer, S., Stocklmayer, V.(2013): Gemstones of WA, Geological Survey of WA; Geological Survey of Western Australia (1917) Annual Progress Report for 1916. Simpson, E.S. (1928) Famous Mineral Localities: Wodgina North West Australia, The American Mineralogist, Vol 13, No.9 September pp 457-468, 1928. Fetherston J.M, Stocklmayer, S.M., Stocklmayer, V.C., (2013) Gemstones of Western Australia. Geological Survey of Western Australia, Mineral Resources Bulletin 25, 306p. Calderwood, M.A., Grguric, B.A., Jacobson, M.I., (2007) Guidebook to the Pegmatites of Western Australia. Hesperian Press, Carlisle, Western Australia. Calderwood, M.A., Grguric, B.A., Jacobson, M.I., (2007) Guidebook to the Pegmatites of Western Australia. Simpson, Edward S. (1928) Famous Mineral Localities: Wodgina, North West Australia, American Mineralogist, Vol. 13, No. 9, September 1928, pp.457-468. David Huston, Richard Blewett, Terrence Mernagh, Shen-Su Sun and Julienne Kamprad (2001) Gold Deposits of the Pilbara Craton: Results of AGSO Research, 1998-2000. AGSO – Geoscience Australia, Record 2001/10. Martin, D.McB., Sheppard, S., Thorne, A. (2005) Geology of the Maroonah, Ullawarra, Capricorn, Mangaroon, Edmund, and Elliott Creek 1:100 000 sheets: Western Australia Geological Survey, 1:100 000 Geological Series Explanatory Notes, 65p. Pegmatites of Western Australia; M.I. Jacobson, M.A. Calderwood, B.A. Grguric; Hesperian Press, Perth, 2007. Pegmatites of Western Australia; M.I. Jacobson, M.A. Calderwood, B. A. Grguric; Hesperian Press, Perth, 2007. Pegmatites of Western Australia; M Jacobson, M Calderwood, B Grguric,; Hesperian Press, Perth, 2007. Pegamtites of Western Australia; M Jacobson, M Calderwood, B Grguric; Hesperian Press, Perth, 2007. Simpson, Edward S. (1951) Minerals of Western Australia Vol 2 (Facsimile ed. 1984). Hesperian Press, Carlisle, Western Australia, p.207. WESSELY, G. (1961): Geologie der Hainburger Berge. Jb. Geol. B.-A., 104, 273-349. Eur. J. Mineral. , 1991, 3, pp. 323-342. Huber, S. und Huber, P. (1977): Mineral-Fundstellen Band 8: Oberösterreich, Niederösterreich und Burgenland. C. Weise Verlag, München, 270 pp. Kolitsch, U., Löffler, E., Schillhammer, H. & Knobloch, G. (2015): 1944) Allophan, Almandin, Apatit, Calcit, Diopsid, dravitischer Turmalin, Felsőbányait, Gips, Halotrichit, Jarosit(? ), Klinozoisit, Melanterit, Mikroklin, Natrojarosit, Opal, Prehnit, Rutil, Sillimanit, Skapolith, Titanit, Tremolit, V-haltiger Muskovit(?) und Zirkon vom ehemaligen Graphitbergbau Hengstberg bei Hafnerbach im Mostviertel, Niederösterreich. Pp. 254-257 in Niedermayr, G. et al. (2015): Neue Mineralfunde aus Österreich LXIV. Carinthia II, 205./125., 207-280. LÖFFLER, Erwin (2005): Ein Pegmatitfund aus der Wachau, Niederösterreich: Rauchquarz, Schörl und Mikroklin aus Grimsing bei Emmersdorf. - Mineralien-Welt, 16/3, 54-59, Haltern (in German). KIESEWETTER, Ludwig (2000h): Quarzkristalle mit Lösungserscheinungen aus Spitz/Donau, NÖ.- Mefos, 11/21, 9-11, Wien. Götzinger, M. A. (1981): Mineralogische Untersuchungen des Magnetitvorkommens Kottaun bei Geras, niederösterreichisches Moldanubikum. Ein Beitrag zur Genese von Skarnen. Sitzungsber. Österr. Akad. Wiss., math.-naturw. Kl., 190, 45-78. Ertl, A., Hughes, J.M., Brandstätter, F., Dyar, M.D., and Prasad, P.S.R. (2003): Disordered Mg-bearing olenite from a granitic pegmatite from Goslarn, Austria: A chemical, structural, and infrared spectroscopic study. Can. Mineral., 41, 1363-1370. Löffler, E., Kolitsch, U., Rausch, L., Knobloch, G., Schillhammer, H. (2018): 2087) Albit, Anatas, Bertrandit, Biotit, Bismutit(? ), Brookit, Chamosit, Columbit-(Fe), Columbit-(Mn), Fluorapatit, Laumontit, Limonit, Mikroklin, Muskovit, Olenit, Pyrit, Quarz, Schörl, Spessartin, ged. Wismut und Zirkon vom Trastallhof bei Fohra nordwestlich Mühldorf, Waldviertel, Niederösterreich. Pp. 223-228 in Walter, F. et al. (2018): Neue Mineralfunde aus Österreich LXVII. Carinthia II, 208./128., 185-254. BECKE, Friedrich (1881): Die Gneissformation des niederösterreichischen Waldviertels.- Miner. Petrogr. Mitth., 4/3, 189-264, Wien. Kolitsch, U. & Löffler, E. (2012): 1759) Apatit, Klinoptilolith-Ca, Meionit, Prehnit, Titanit, Zirkon und weitere Mineralien aus einem Steinbruch bei Zintring, Maria Laach am Jauerling, Waldviertel, Niederösterreich. Pp. 161-162 in Niedermayr, G. et al. (2012): Neue Mineralfunde aus Österreich LXI. Carinthia II, 202./122., 123-180. KIESEWETTER, Ludwig (2000c): Rauchquarze aus Bengelbach.- Mefos, 11/20, 10-11, Wien. KOLLER, F. & G. NIEDERMAYR (1978): Die Mineralvorkommen der Diorite des nördlichen Waldviertels. – Annal. Naturhist. Mus. Wien, 82: 193-208. Ertl, A., Pertlik, F., Dyar, M. D., Prowatke, S., Hughes, J. M., Ludwig, T., Bernhardt, H.-J. (2004): Fe-rich olenite with tetrahedrally coordinated Fe3+ from Eibenstein, Austria: Structural, chemical, and Mössbauer data. Canadian Mineralogist 42, 1057-1063. Ertl, A., Schuster, R., Prowatke, S., Brandstätter, F., Ludwig, T., Bernhardt, H.-J., Koller, F., Hughes, J. M. (2004): Mn-rich tourmaline and fluorapatite in a Variscan pegmatite from Eibenstein an der Thaya, Bohemian massif, Lower Austria. European Journal of Mineralogy 16, 551-560. Kolitsch, U. & Schillhammer, H. (2014): 1881) Amphibol, Apatit, Chabasit, Chlorit, Diopsid, Epidot, Granat, Hamatit, Hyalith, Ilmenit, Limonit, Magnetit, Mikroklin, Pyrit, Quarz, Rutil und Titanit vom Gimpelfeld bei Raabs, Waldviertel, Niederösterreich. P. 116 in Niedermayr, G. et al. (2014): Neue Mineralfunde aus Österreich LXIII. Carinthia II, 204./124., 65-146. Gressenberger, H. (2017): Exkursion Waldviertel. VLMF Vereinsnachrichten Nr. 69, 9-12. Kurz, B. (2009): Zn-Fe-Pb-Cu-Mineralisationen in Marmoren der Bunten Serie, Böhmische Masse, Niederösterreich. Diplomarbeit, Universität Wien, 147 S.
Huber, S. & Huber, P. (1977): Mineral-Fundstellen Band 8: Oberösterreich, Niederösterreich und Burgenland. C. Weise Verlag, München, 270 pp. ; KOLLER, F. & G. NIEDERMAYR (1978): Die Mineralvorkommen der Diorite des nördlichen Waldviertels. – Annal. Naturhist. Mus. Wien, 82: 193-208. Heritsch, H. (1963) : Exkursion in das Kristallin der Koralpe. In : Mitteilungen des Naturwissenschaftlichen Vereines für Steiermark, Band 93, 1963, p.178 –198. Reiter, E. & Mikaluschek, K. (2016): Besondere Mineralfunde vom Bau der Mühlviertler Schnellstraße S10 zwischen Linz und Freistadt in Oberöstereich. OÖ. Geonachrichten 30, 29-42. Arthofer, P. (2005): Zinnsteinführende Pegmatite aus Meitschenhof bei Pregarten, Bezirk Freistadt, Oberösterreich. OÖ. Geonachrichten 20, 10-22. Kolitsch, U. (2017): 2017) Apatit, Chabasit-Ca, Chamosit(-Klinochlor), Heulandit-Ca, Jarosit, Prehnit, Pyrit, Stellerit, Stilbit-Ca(? ), Titanit und weitere Mineralien aus dem Gebiet Sennigrat-Kreuzjoch-Hochjoch bei Schruns, Montafon, Vorarlberg. Pp. 231-232 in Walter, F. et al. (2017): Neue Mineralfunde aus Österreich LXVI. Carinthia II, 207./127., 217-284. Kolitsch, U. (2014): 1857) Allophan(? ), Aragonit, Asbolan, Aurichalcit, Brochantit, Calcit, Chalkopyrit, Chlorit, Covellin, Galenit, Goethit, Greenockit(? ), Hydrozinkit, Jarosit, Lepidokrokit, Malachit, Mikroklin, Pyrit, Pyrrhotin, Quarz, Siderit, Smithsonit und Sphalerit von einem alten Erzschurf bei der Alpe Fresch im Silbertal, Montafon, Vorarlberg. Pp. 94-96 in Niedermayr, G. et al. (2014): Neue Mineralfunde aus Österreich LXIII. Carinthia II, 204./124., 65-146. [var: Hyalophane] Jurkoviae, I., Slovenec, D., and Namjesnik, K. (1993): Bulletin of the Geological Society of Greece 28(3), 677-690. C. Lemanski, Jr. (re-entry of lost Mindat data). Revista Brasileira de Geociências 30(1):030-034. Jost, H., and de Tarso Ferro de Oliveira Fortes, P. (2001): Mineralium Deposita 36, 358-376. Revista Brasileira de Geociências. 30(2):256-260, (2000). ; Econ Geol. (1995) 90:308-321; de Oliveira, C. G., de Queiroz, C. L., & Pimentel, M. M. (2008). The arenopólis-mara rosa Gold-Copper Belt, Neoproterozoic Goiás Magmatic Arc. Brazilian Journal of Geology, 30(2), 219-221. Guimar˜aes, C.P. (1941) Djalmaite, a new radio-active mineral. American Mineralogist: 26: 343–346. 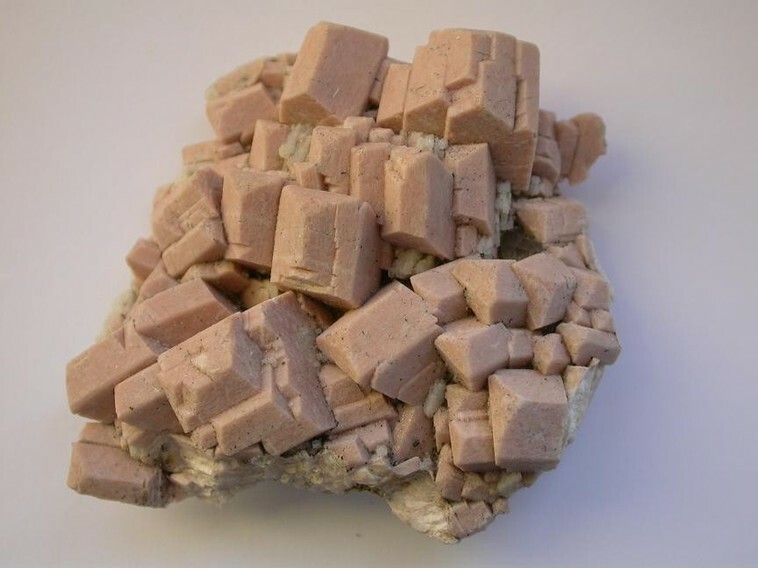 various photographs; Bermanec, V., Scholz, R., Marković, F., Gobac, Ž. Ž., & Chaves, M. L. D. S. C. (2011) Mineralogy of the Boa Vista pegmatite, Galileia, Minas Gerais, Brazil. In 5th international symposium on granitic pegmatites, PEG 2011. Van King; Wilson, W E (2012) Famous Mimeral localities: The Jonas Mine, Itatiaia, Minas Gerais, Brazil. Mineralogical Record 43:289-317. Fernandes, A. G., Karfunkel, J., Hoover, D. B., Sgarbi, P. B. de A., Sgarbi, G. N. C., Oliveira, G. D., Gomes, J. C. de S. P., and Kambrock, K., 2014, The basal conglomerate of the Capacete Formation (Mata da Corda Group) and its relation to diamond distributions in Coromandel, Minas Gerais state, Brazil: Brazilian Jour. of Geology, v. 44, no. 1, p. 91-103. Luiz Alberto Dias Menezes, Fo. Jordt-Evangelista, H., Lana, C., Delgado, C. E. R., & Viana, D. J. (2016). Age of the emerald mineralization from the Itabira-Nova Era District, Minas Gerais, Brazil, based on LA-ICP-MS geochronology of cogenetic titanite. Brazilian Journal of Geology, 46(3), 427-437. Luis Menezes; Quéméneur, J., & Lagache, M. (1999). Comparative study of two pegmatitic fields from Minas Gerais, Brazil, using rubidium and cesium content of the micas and feldspars. Brazilian Journal of Geology, 29(1), 27-32. Quéméneur, J., & Lagache, M. (1999). Comparative study of two pegmatitic fields from Minas Gerais, Brazil, using rubidium and cesium content of the micas and feldspars. Brazilian Journal of Geology, 29(1), 27-32. Bull. Soc. Franç. Minéralo. Cristallo. , 1964, LXXXVII, p. 285. Fernando R.M. Pires and A. Raphael Cabral (1998) The Volta Grande pegmatites, Minas Gerais, Brazil: an example of rare-element granitic pegmatites exceptionally enriched in lithium and rubidium: Discussion. The Canadian Mineralogist, 36, 1157-1158.; Quéméneur, J., & Lagache, M. (1999). Comparative study of two pegmatitic fields from Minas Gerais, Brazil, using rubidium and cesium content of the micas and feldspars. Brazilian Journal of Geology, 29(1), 27-32. Ulbrich, M. N. (1993). Mineralogy of nepheline syenites from the Poços de Baldas Alkaline massif, se Brazil: chemistry, x-ray data and microtextures of feldspars. Brazilian Journal of Geology, 23(4), 388-399. Dunn, P.J. ; Gaines, R. W.; Wolfe, C.Wroe & Barbosa, C.do P. (1978): Epitaxial Wodginite and Cassiterite from Lavra Jabuti, Baixio, Galileia, Minas Gerais, Brazil. 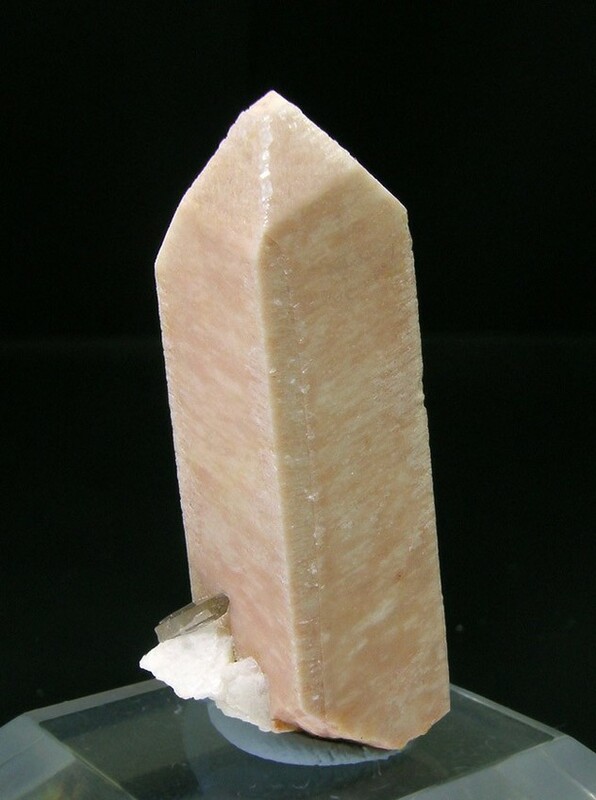 Mineralogical Record 9 (1), 14-19.
various added photos; Dutra, C. V., & Formoso, M. L. L. (2011). Considerações sobre os elementos terras raras em apatitas. Geochimica Brasiliensis, 9(2). Rocks & Min. : 63: 45, 389. Grainger, C.J., Groves, D.I., Tallarico, F.H.B., and Fletcher, I.R. (2008): Ore Geology Reviews 33, 451-489. Monteiro, L.V.S., Xavier, R.P., de Carvalho, E.R., Hitzman, M.W., Johnson, C.A., de Souza Filho, C.R., and Torresi, I. (2008): Mineralium Deposita 43, 129-159. JULIANI, C.; CORRÊA-SILVA, R. H.; MONTEIRO, L. V. S.; BETTENCOURT, J. S.; NUNES, C. M. D. (2002). The Batalha Au - Granite System - Tapajós Gold Province, Amazonian Craton, Brazil: Hydrothermal alteration and regional implications. Precambrian Research, v. 119, n. 1-4, p. 225-256. Witzke, T., Steins, M., Doering, T., Schuckmann, W., Wegner, R., Pöllmann, H. (2011): Fluornatromicrolite, (Na,Ca,Bi)2Ta2O6F, a new mineral from Quixaba, Paraíba, Brazil. Canadian Mineralogist, 49, 1105-1110; Ferreira, A., Ferreira, V. P., Soares, D. R., & Vilarroel-Leo, H. S. (2005). Chemical and mineralogical characterization of elbaites from the Alto Quixaba pegmatite, Seridó province, NE Brazil. Anais da Academia Brasileira de Ciências, 77(4), 729-743. Mineralogical Magazine , G.B. , 1973, 39, pp. 571-576. [var: Amazonite] e Souza, M. B. D. A., França, R. H. M., & de Lira, L. C. M. (2016, July). Vieirópolis Pegmatite Field, Northwest of Paraíba State, Brazil: New Occurrences of Amazonite Pegmatites. In Second Eugene E. Foord Pegmatite Symposium (p. 24).